Rochester, N.Y. - Step right up! Celebrate arcade amusements in all their beeping, blipping, vibrant glory at Boardwalk Arcade, an original, summertime exhibit back by popular demand and opening at The Strong® National Museum of Play® on Saturday, May 24. Step into a scene reminiscent of 19th- and early 20th-century resorts such as Coney Island and Atlantic City, where Americans from across the nation flocked for good old summertime fun. 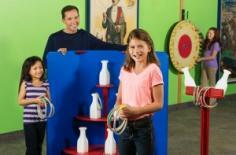 Journey through the evolution of seaside amusements and play a variety of carnival games such as ring toss. Challenge yourself on redemption games such as Skee Ball, Hoop Fever, Ticket Monster, and Harpoon Lagoon. Win tickets and use them to collect a variety of prizes, including stickers, oversized sun glasses, and stuffed animals. Laugh at your distorted reflection in silly fun-house mirrors and then step right up to an oversized beach cut-out for an unforgettable photo opportunity. Young children can dig right in for creative play with beach toys right at the Boardwalk Arcade shoreline. What does your future hold? Spin the wheel of fortune to find out. More contemporary public amusements add to the fun, including Fruit Ninja, Temple Run, and Batman Whack-a-Villain. Also enjoy an opportunity to play on historic video arcade machines including Spy Hunter (1983), Punch-Out!! (1984), Star Wars: The Empire Strikes Back (1985), Virtua Racer (1992), Prop Cycle (1996), and The Ocean Hunter (1998). Also view artifacts from The Strong&apos;s world-renowned collections that evoke the history of carnivals and beachside resorts including toy carousels, chalkware figurines, and brilliantly colored posters featuring KAR-MI-the stage name of Joseph Hallworth (1872-1956), an entertainer who worked in the Wild West shows, circuses, and other venues from the 1980s to the beginning of World War I. Boardwalk Arcade is produced by The Strong&apos;s International Center for the History of Electronic Games and remains at the museum through September 7, 2014. Please note: While several of the games and activities in Boardwalk Arcade can be played freely, some may require purchased tokens. Money collected from the sale of tokens helps maintain these original artifacts. Museum Hours: Monday-Thursday, 10 a.m. to 5 p.m.; Friday and Saturday, 10 a.m. to 8 p.m.; Sunday, noon to 5 p.m.
General Admission Fees (does not include admission to Dancing Wings Butterfly Garden®): age 2 and older $13.50, under age 2 free, members free. Admission to Dancing Wings Butterfly Garden: General Admission fee plus $3 for members, $4 for nonmembers, under age 2 free. Entry is by timed ticket only. Parking: Free parking is available at the museum for all guests on a first-come, first-served basis. Please note that, on high visitation days, the museum lot may reach capacity early in the day. If space is not available on site at the time of your visit, additional parking is available at neighboring municipal garages for a fee. The Strong is not responsible for fees incurred at off-site locations.